After I wrote my Flora Quilt pattern, I wanted to make a lap size version for myself. 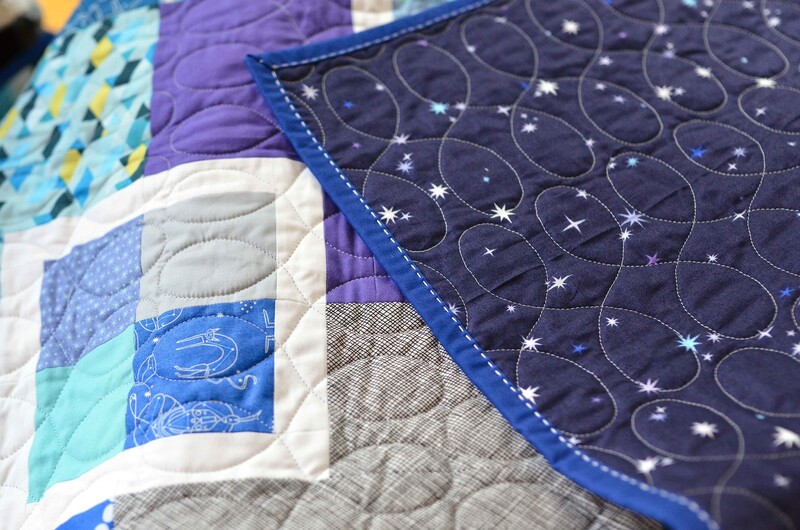 The colors in the quilt were inspired by Lizzy House's Constellations collection and I used a few of my precious scraps up in the quilt. I do wish that I hadn't used some of the busier fabrics in the quilt, they are a little distracting, but these are some of my favorite fabrics and I am keeping this one so it doesn't bother me too much. 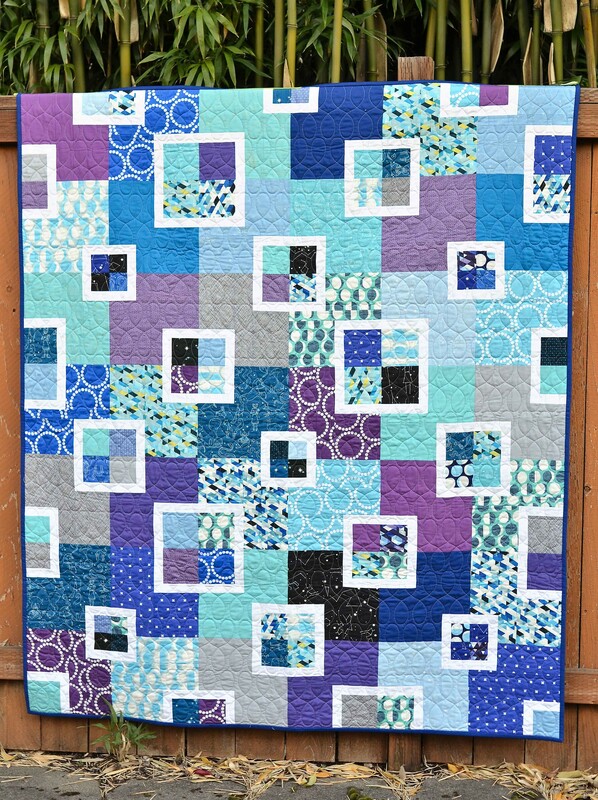 When I sent my Fussy Cut Sampler quilt to Crinklelove to be quilted, I sent this one along with it. I have admired these loops for a long time and love how they turned out. I did my normal big stitch binding and backed the quilt with Lizzy House stars print. I love this quilt! 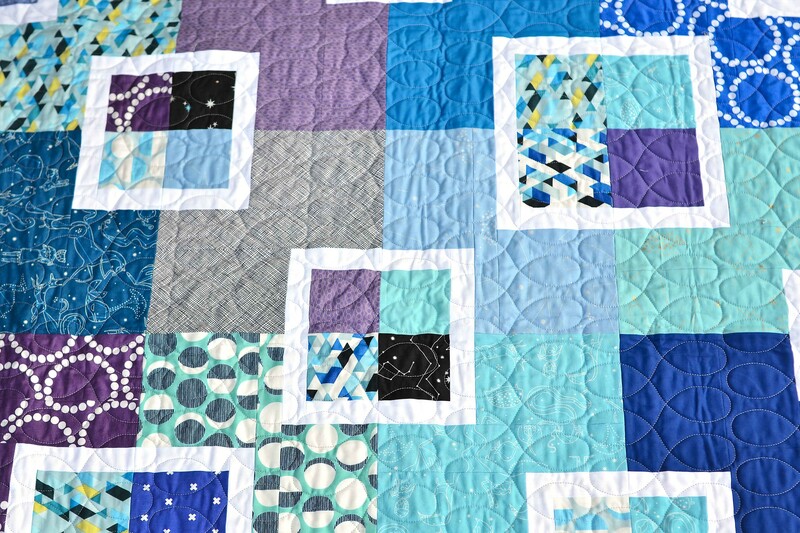 The fabric is so amazing, the colors work perfectly, the sashing around those little squares sets it off perfectly. I'm so in love. I think I'll have to make one! Thank you so much! If you make your own, I would love to see a photo! I love this quilt. The colors are perfect. I just took note of your binding method. I’m going to give it a try. I’ll let you know how it goes. It will take a few months, I’m sure. This quilt turned out great. I see no problem with any of the fabric you used. I have been looking for a pattern that uses a variety of fabric with some larger pieces to really highlight the design. Would it be pretty easy to increase the number of blocks to make it queen size? It wouldn't be too hard. There is a pattern to the block placement, so you would just have to make extra blocks. Enjoy your new lap quilt. LOVE the big stitch binding finish!! Thank you! I love binding quilts this way, I don't think I will ever go back! 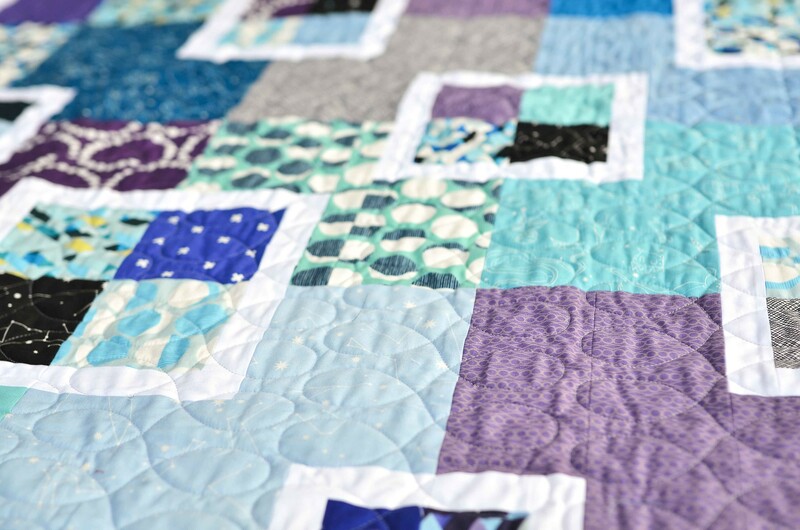 Such an amazing Quilting Designs. I really love them. I would love to try them for sure.